My 1st kees was from a back yard breeder-for my 2nd I chose a back yard breeder with some Champions in the pedigree-what I got that time was a dog with severe hip dysplasia and epilepsy and he died at 6 yrs old. I have never forgotten the things my Maxie taught me. After attending my first Atlanta KC show-I knew what I wanted to do-after meeting Mike and Melissa Brown and their Lovely Ch. Flakkee Fascination I knew where to get my 1st show kees from. That is when Joanie Fraser came into my life and trusted me with my Finny who became Ch. Flakkee Foto Finish UD TT HOF. Here at Marrkees my dogs are house dogs and beloved family members. Any puppies that are breed here are all raised under foot with a lot of personal attention. 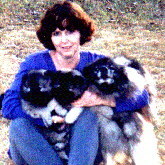 I am a member of The Keeshond Club of America-The American Keeshond Society-The Atlanta Kennel club. I abide by the code of ethics as set by These Clubs. MARRKEES is now located near Los Angeles, California USA.!! The kees and I live at the Beach, and we have a small mountain residence as well!! My family consists of my kees, my intended Dennis, myself and always a lovely assortment of wild birds and other wild beings nearby. There is a lot of information on the web about this breed of dog below are a few of my recommended sites. I always have Ch. Stud service but to approved females only--referrals to other breeders--information on the health and raising of a happy Keesond. My Kees have excelled in the show rings, the obedience rings and now the Agility rings as well. I feel that it is important to breed using the AKC standard of perfection as a guide. Equally important to me is the temperament-soundness-and health. I am a Registered Nurse. Dennis and I often fling arrows, ride street and dirt bikes in the mountains, bicycle at the beach and play with our keesies everywhere.